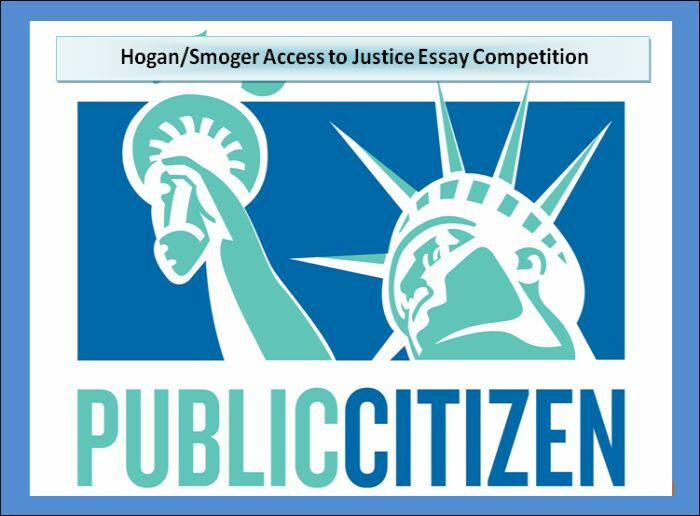 R. Ben Hogan III of Hogan Law Office, PC is now sponsoring the Hogan/Smoger Access to Justice Essay Competition in Birmingham, Alabama, and Gerson H. Smoger of Smoger & Associates in Dallas, Texas, and Oakland, California. Administered by Public Citizen, the competition is open to all current law students, law graduates, and all masters of law students. The winner of the contest will receive $5,000 award. Public Citizen is a nonprofit consumer advocacy organization that champions the public interest – your interests – in the halls of power. The competition is open to all current law students, law graduates, and all masters of law students. The applicant’s submissions must be emailed to Amanda Fleming at afleming@citizen.org. Submissions must be emailed as Microsoft Word documents. They may be full-length law review articles or shorter academic essays and should use footnotes (not endnotes). The word count may be between 6,000 and 25,000 words, not including footnotes. The winner will receive $5,000. Only one winning paper will be chosen and only one prize awarded. The application will close on April 30, 2019, at 11:59 p.m. Helping students passing the college with dignity. We help students managing personal finances.